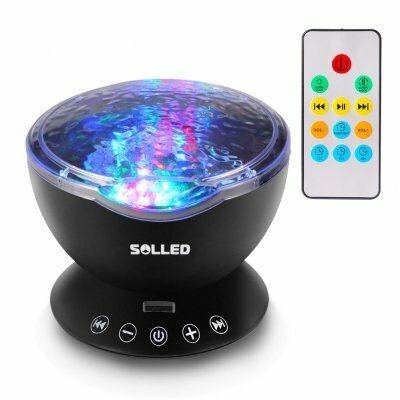 Successfully Added Music Projector Night Light Remote Control Lamp with Built-in Mini Music Player to your Shopping Cart. Long press the switch key 3 seconds to turn on the light mode 1 light, while lullaby music 1 play. Short press the switch key to replace the light mode. If you only need to replace the hypnotic song, press the remote controller or host to replace the Previous or Next song. When inserting the TF card or external source, the lullaby automatically shut down. When inserting the external sources, the host and remote control Previous or Next song can not been operated. According to the remote control H1 / H2 / H4 that the host timer settings, in 1 hour / 2 hours / 4 hours after the automatic shutdown. Press the remote control TIMER OFF button to cancel the timer function. Long press the key to turn off. Music at The Same Time to Relax Your Body and Soul. - Long press the switch key 3 seconds to turn on the light mode 1 light, while lullaby music 1 play. - Short press the switch key to replace the light mode. - If you only need to replace the hypnotic song, press the remote controller or host to replace the Previous or Next song. - When inserting the TF card or external source, the lullaby automatically shut down. - When inserting the external sources, the host and remote control Previous or Next song can not been operated. - According to the remote control H1 / H2 / H4 that the host timer settings, in 1 hour / 2 hours / 4 hours after the automatic shutdown. - Press the remote control TIMER OFF button to cancel the timer function. - Long press the key to turn off. - Please do not allow children under 6 years old to use it alone. - Please do not place the product on non-flat surface to prevent fall broken. - This product is non-waterproof, prohibited storage or use in the place of humid or high temperature. - The way to adjust the angle: You need to push the projection panel downward to change the angle, please notice that , it can be adjusted 45 degree.